Lack of sleep seems to be something of an epidemic these days. With the pressures and anxieties of modern times and the inundation of information and technology it is little wonder. It seems like we all suffer from nuisances of the twenty first century which were supposed to make our lives less problematic. Worries and everyday stresses plague us all and now with new research into blue light interference it’s not surprising how we are incapable of shutting down at nighttime. For me sleeping hardships also happen to be a “genetic curse”. I am prone to restless nights and tossing and turning more times than I can count. A few years back my Fitbit sleep report revealed a broken sleep pattern of awaking twenty seven times on a random night. That was overly alarming yet expected. The calming affects of lavender is no secret. It has been used for centuries now to heal and treat. I am sure you hold a memory or two from a relative or friend proclaiming the joys and benefits of this plant; be it via pillow sachets or through hand creams. Research has shown that lavender helps relieve stress and thus promoting a good nights sleep. And it seems as though in recent times the beauty industry has rediscovered this natural calming powerhouse. Reinventing a staple homely remedy and capatilzing on the indisputable benefits that promote a better nights rest. From pillow sprays to eye masks loaded with dried lavender, such products help to permeate the senses and offer some welcome calm to our frantic minds. Even baby (or more like parents) can indulge in the wonders of lavender with this pillow spray or this bath bomb to help induce slumber. I can’t completely recall my own foray into discovering and incorporating lavender at night. I think it may have been an introduction via a blog post but I do know it featured the Sleepy Lotion. I do remember immediately needing to implement this product into my nightly routine. I placed my order and impatiently awaited it’s arrival. Counting down the days until I experienced unprecedented nighttime rest. To say I was expected drastic improvement is an understatement and thankfully this lotion delivered. It was thick and a resplendent shade of pale purple that effortlessly melted into my skin and enveloped me in a wondrously divine and calming scent. It wasn’t long before I depleted that small container and found myself back online placing another order. This time I however I noted that Lush also had a similar product, but in spray form. And thus a new obsession began. Seemingly these are two products best suited for after dark. But you can still apply the body lotion as you please throughout the day. 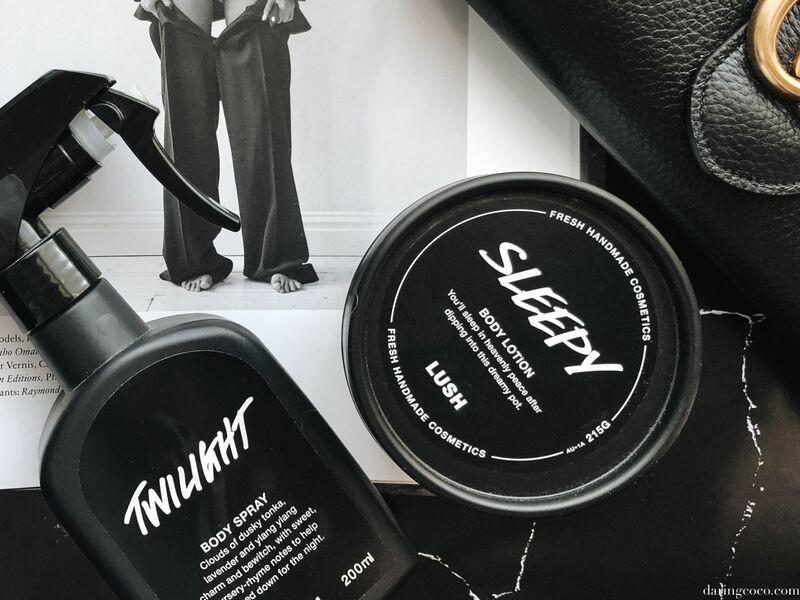 Lush Twilight spray can be used on bedlinen and clothing but also sprayed onto skin too. I prefer to use the Lush Twilight spray directly on my pillowcase. I find a single spritz is adequate enough to last through the night and it also completely infuses throughout the room too. The only difference between the two is that Lush Twilight spray is not limited to skin. I’ve been using both products for over two years now and I have noticed improvement during bedtime. I’m still waking erratically through the night but I have noted a difference in temperament when I forget to spray my pillow. I also find the scent very comforting and I happen to fall asleep faster. These products, like all of Lush’s items, are handmade using ethically sourced materials and best of all not tested on animals. I’ve come to prefer the Lush Twilight spray over the body lotion. Mainly because I use fake tan overnight night and I prefer not to use them simultaneously. Thus making the Lush Twilight spray more ideal as I can spritz it on my pillow or bedlinen instead. Overall it’s more effortless to utilise but still provide maximum results. However the body lotion does have the advantage of leaving skin incredibly silken. You could even replace your usual body lotion for Lush’s Sleepy lotion, a cocoa butter that is ideal for achieving supple skin whilst getting the benefits of a better nights rest too. I’m curious, do you use or implement any lavender based scents into your bedtime routine? You can also peruse an edit of lavender products below set to induce a peaceful slumber.